Blogito Ergo Sum: Hail To The Puppet? This blog began as a writing and literature blog with the occasional Op-Ed piece on current events & issues. The political writing has, slowly but surely, taken this blog over. Readers will still be treated to some of my thoughts on pop culture and sports, but, for the most part, Blogito Ergo Sum will feature my opinions on the state of our union and world. 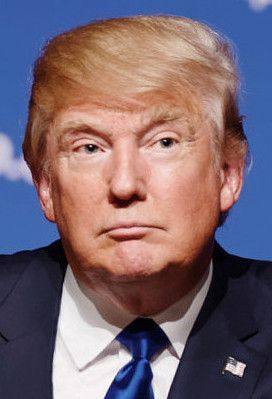 During a recent joint press conference with presidents Donald Trump and Vladimir Putin in Finland, President Trump stated he saw no reason to believe that Russia had interfered in the 2016 US election despite the findings of American intelligence agencies. Subject: Donald Trump New Hampshire Town Hall | Date: 08/19/2015 | Photographer: Michael Vadon |This file is licensed under the Creative Commons Attribution-Share Alike 2.0 Generic license. 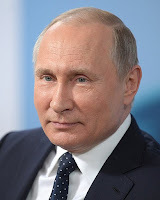 Subject: Vladimir Putin | Date: 03/15/2018 | Photographer: Press Service of the President of the Russian Federation |This file is licensed under the Creative Commons Attribution 4.0 International license. While these comments shocked political pundits and lawmakers alike, the comments in question were actually par for the course. Ever since Trump took office, he has been a pro Russia president. I won't rehash every move Trump has made over the last year and a half, but among his greatest hits are lifting sanctions against Russia, reopening a Russian embassy known to be an espionage center, and advocating for Russia to be allowed to rejoin the G8. Only now are people talking about the possibility that Putin maybe blackmailing President Trump. To that I say, "WELL DUH!" I have suspected as much for over a year. Think about it. Watch his body language. When he reads prepared anti Russian statements, his arms are folded and his head is down as if he's drawing inward toward himself. It is a classic fear response. Of course, I can't prove anything, but it does make one wonder. One also has to wonder why Trump won't release his tax returns. According to The Washington Post, President Trump’s business tried to make a deal to build a Trump Tower in Moscow while he was running for president in 2015 & 2016. We don't know what other deals he tried to make in Russia or what the outcomes were. It is theoretically possible that whatever Putin has on Trump is a result of one of those deals. Like I said, this is all pure speculation on my part. We don't know what is actually motivating our president to snuggle up to our enemy. However, it is not speculation that his actions are making us look weak and untrustworthy in the eyes of our allies. ...visit my Book Store Here. In 2008, I began the blog Blogito Ergo Sum as a writing and literature blog. I found myself writing multiple entries about food. Thus, I opened a second blog called On My Plate where I could share my thoughts on cheese, wine, restaurants, recipes, and other aspects of the epicurean realm. | Back in the day, on Blogito Ergo Sum, I used to do the occasional political/current events Op-Ed in between my writings about books and writing. Gradually, the opinion pieces began to outweigh the literary posts. With this in mind, I yielded to the tides and refurbished Blogito Ergo Sum into a full fledged political/current events blog. It's NOT a NEWS blog; I can't break the next big story. The blog simply allows me to put the NEWS, which is already out there, into a certain perspective. | Eventually, my thoughts became increasingly occupied with thoughts of a spiritual nature. In order to share these thoughts, I started Musings From The Christian Left. Just as it sounds, Musings is a blog which explores Christian topics from a liberal point of view. | Then, just for fun, I built Super Fan, where I could share the occasional thought about Sci-Fi & comics. Visit my friends at Mesothelioma.net to learn about Mesothelioma's causes, symptoms, and treatments.